Remove ignition coil. Refer to EM-36, "Exploded View". 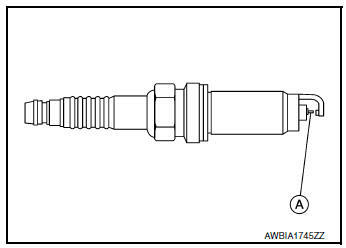 Remove spark plug using Tool. Visually check the electrode for dirt and wear and the insulator for burning. Do not use a wire brush for cleaning the spark plugs. Replace as necessary. If plug is covered with carbon, a spark plug cleaner may be used. Checking and adjusting plug gap is not required between change intervals. 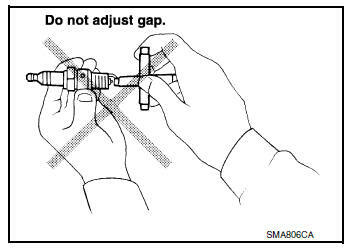 If the gap is out of specification, replace the spark plug. CAUTION: Do not drop or shock plug.